Changed in version 3.0: Before Weblate 3.0, the privilege system was based on Django, but is now specifically built for Weblate. If you are using an older version, please the consult documentation for that version, the information here will not apply. Weblate comes with a fine grained privilege system to assign user permissions for the whole instance, or in a limited scope. The permission system based on groups and roles, where roles define a set of permissions, and groups assign them to users and translations, see Users, roles, groups and permissions for more details. To completely lock down your Weblate installation, you can use LOGIN_REQUIRED_URLS to force users to log in and REGISTRATION_OPEN to prevent new registrations. To manage permissions for a whole instance, just add users to Users (this is done by default using the Automatic group assignments), Reviewers and Managers groups. 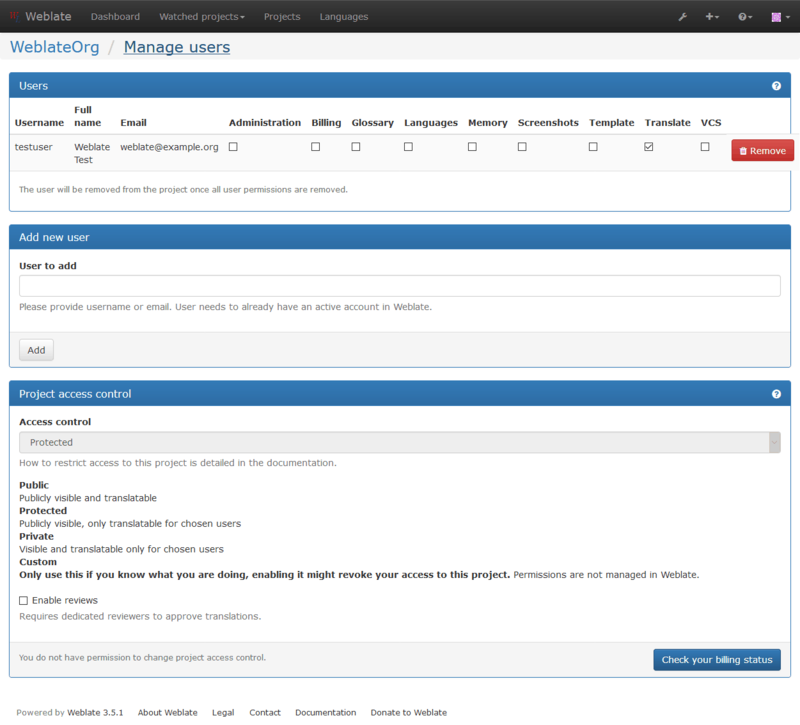 Keep all projects configured as Public (see Per project access control). Set your projects to Protected or Private , and manage users per project in the Weblate interface. You can additionally grant permissions to any user based on project, language or a component set. To achieve this, create a new group (e.g. Czech translators ) and configure it for a given resource. Any assigned permissions will be granted to members of that group for selected resources. This will work just fine without additional setup, if using per project permissions. For permissions on the whole instance, you will probably also want to remove these permissions from the Users group, or change automatic assignment of all users to that group (see Automatic group assignments). By enabling ACL, all users are prohibited from accessing anything within a given project, unless you add the permissions for them to do just that. You can limit user’s access to individual projects. This feature is turned on by Access control in the configuration of each respective project. This automatically creates several groups for this project, see Predefined groups. To allow access to this project, you have to add the privilege either directly to the given user, or group of users in the Django admin interface, or by using user management on the project page, as described in Managing per project access control. Statistics for the whole instance, including counts for all projects. Language summary for the whole instance, including counts for all projects. You can set up Weblate to automatically add users to groups based on their email addresses. This automatic assignment happens only at the time of account creation. This can be set up in the Django admin interface (in the Accounts section). The automatic group assignment for the Users and Viewers groups will always be created by Weblate upon migrations, in case you want to turn it off, simply set the regular expression to ^$, which will never match. Individual permissions defined by Weblate. You can not assign individual permissions, this can only be done through assignment of roles. Role defines a set of permissions. This allows reuse of these sets in several places, and makes the administration easier. Compared against the scope of the project, if not set, this matches no project. You can use Project selection to automate inclusion of all projects. The scope component is matched against this list, if not set, this is ignored. Obviously this has no effect when checking access of the project scope, so you will have to grant access to view all projects in a component list by other means. By default this is achieved through the use of the Viewers group, see Default groups and roles). Compared against scope of translations, if not set, this matches no language. You can use Language selection to automate inclusion of all languages. A user has to be a member of a group linked to the project. Only membership is enough, no specific permissions are needed to access a project (this is used in the default Viewers group, see Default groups and roles). All users and groups can be managed using the Django admin interface, available under /admin/ URL. Users with the Can manage ACL rules for a project privilege (see Access control) can also manage users in projects with access control turned on through the project page. You can add users, or remove them from a project, or make them owners of it. Weblate comes with a predefined set of groups for a project, wherefrom you can assign users. Has all permissions available in the project. Can manage glossary (add or remove entries, or upload). Can manage screenshots - add or remove them, and associate them to source strings. Can edit translation templates in Monolingual components and source string info. Can translate the project, and upload translations made offline. Can manage VCS and access the exported repository. Can access billing info (see Billing). By choosing Custom as Access control, Weblate will stop managing access for a given project, and you can set up custom rules in the Django admin interface. This can be used to define more complex access control, or set up a shared access policy for all projects in a single Weblate instance. If you want to enable this for all projects by default, please configure the DEFAULT_ACCESS_CONTROL. By turning this on, Weblate will remove all Per project access control it has created for this project. If you are doing this without admin permission from the instance, you will instantly loose your access to manage the project. The global privileges are not granted to any default role. These are powerful and they are quite close to the superuser status - most of them can affect all projects on your Weblate installation. Defines permissions for non authenticated users. This group contains only anonymous users (see ANONYMOUS_USER_NAME). You can remove roles from this group to limit permissions for non authenticated users. By default all users are members of this group, using Automatic group assignments. Never remove the predefined Weblate groups and users, this can lead to unexpected problems. If you do not want to use these features, just remove all privileges from them.